Molecular cell biology has long been dominated by a protein-centric view. But the emergence of small, non-coding RNAs challenges this perception. These plentiful RNAs regulate gene expression at different levels, and have essential roles in health and disease. RNA interference: hitting the ON switch. Researchers in San Francisco have findings that suggest a whole new side to RNA interference. Erika Check reports on their attempts to make a revolutionary field more revolutionary still. RNA interference (RNAi) is a mechanism that inhibits or activates gene expression at the stage of translation or by hindering the transcription of specific genes. RNAi targets include RNA from viruses and transposons (a form of innate immune response), and also plays a role in regulating development and genome maintenance. Small interfering RNA strands (siRNA) are key to the RNAi process, and have complementary nucleotide sequences to the targeted RNA strand. Specific RNAi pathway proteins are guided by the siRNA to the targeted messenger RNA (mRNA), where they "cleave" the target, breaking it down into smaller portions that can no longer be translated into protein. A type of RNA transcribed from the genome itself, microRNA (miRNA), works in the same way. The RNAi pathway is initiated by the enzyme dicer (see below), which cleaves long, double-stranded RNA (dsRNA) molecules into short fragments of 20–25 base pairs. One of the two strands of each fragment, known as the guide strand, is then incorporated into the RNA-induced silencing complex (RISC) and pairs with complementary sequences. The most well-studied outcome of this recognition event is post-transcriptional gene silencing. This occurs when the guide strand specifically pairs with a mRNA molecule and induces the degradation by argonaute, the catalytic component of the RISC complex. Another outcome is epigenetic changes to a gene – histone modification and DNA methylation – affecting the degree the gene is transcribed. The selective and robust effect of RNAi on gene expression makes it a valuable research tool, both in cell culture and in living organisms because synthetic dsRNA introduced into cells can induce suppression of specific genes of interest. RNAi may also be used for large-scale screens that systematically shut down each gene in the cell, which can help identify the components necessary for a particular cellular process or an event such as cell division. Exploitation of the pathway is also a promising tool in biotechnology and medicine. Historically, RNA interference was known by other names, including post transcriptional gene silencing, transgene silencing, and quelling. Only after these apparently-unrelated processes were fully understood did it become clear that they all described the RNAi phenomenon. RNAi has also been confused with antisense suppression of gene expression, which does not act catalytically to degrade mRNA, but instead involves single-stranded RNA fragments physically binding to mRNA and blocking protein translation. In 2006, Andrew Fire and Craig C. Mello shared the Nobel Prize in Physiology or Medicine for their work on RNA interference in the nematode worm C. elegans, which they published in 1998. Each strand has a 5' phosphate group and a 3' hydroxyl (-OH) group. This structure is the result of processing by Dicer, an enzyme that converts either long dsRNAs or hairpin RNAs into siRNAs. siRNAs can also be exogenously (artificially) introduced into cells by various transfection methods to bring about the specific knockdown of a gene of interest. Essentially any gene of which the sequence is known can thus be targeted based on sequence complementarity with an appropriately tailored siRNA. This has made siRNAs an important tool for gene function and drug target validation studies in the post-genomic era ! Dicer is an RNAse III nuclease that cleaves double-stranded RNA (dsRNA) and pre-microRNA (miRNA) into short double-stranded RNA fragments called small interfering RNA (siRNA) of about 20-25 nucleotides long, usually with a two-base overhang on the 3' ends. Dicer contains two RNase domains and one PAZ domain; the distance between these two regions of the molecule is determined by the length and angle of the connector helix and determines the length of the siRNAs it produces. 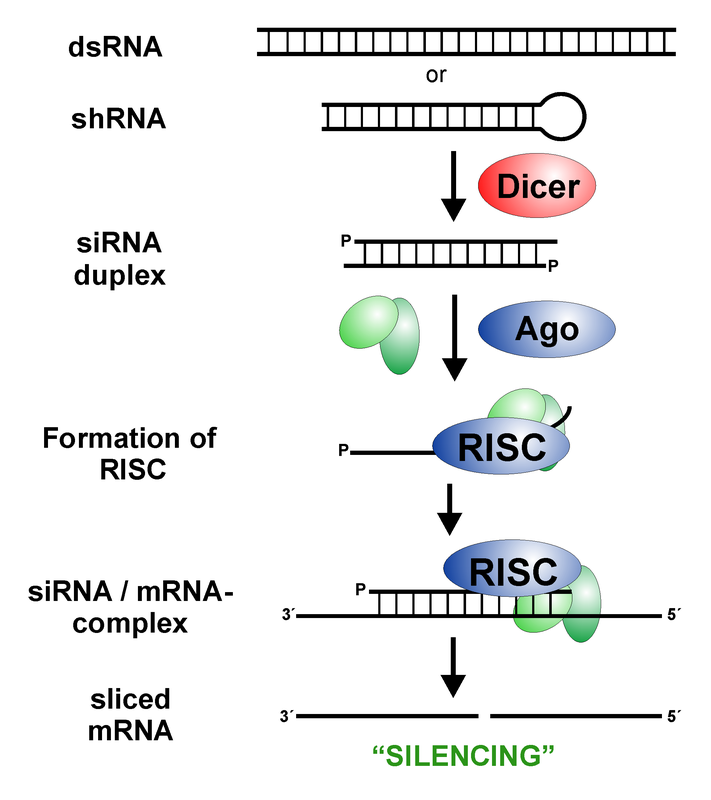 Dicer catalyzes the first step in the RNA interference pathway and initiates formation of the RNA-induced silencing complex (RISC), whose catalytic component argonaute is an endonuclease capable of degrading messenger RNA (mRNA) whose sequence is complementary to that of the siRNA guide strand. The enzyme Dicer was given its name by Emily Bernstein, a graduate student in Greg Hannon's group at the Cold Spring Harbor Laboratory, who first demonstrated its dsRNA "dicing" activity. Organisms vary in their ability to take up foreign dsRNA and use it in the RNAi pathway. The effects of RNA interference can be both systemic and heritable in plants and C. elegans, although not in Drosophila or mammals. In plants, RNAi is thought to propagate by the transfer of siRNAs between cells through plasmodesmata (channels in the cell walls that enable communication and transport). The heritability comes from methylation of promoters targeted by RNAi; the new methylation pattern is copied in each new generation of the cell. A broad general distinction between plants and animals lies in the targeting of endogenously produced miRNAs; in plants, miRNAs are usually perfectly or nearly perfectly complementary to their target genes and induce direct mRNA cleavage by RISC, while animals' miRNAs tend to be more divergent in sequence and induce translational repression. This translational effect may be produced by inhibiting the interactions of translation initiation factors with the messenger RNA's polyadenine tail. Some eukaryotic protozoa such as Leishmania major and Trypanosoma cruzi lack the RNAi pathway entirely. Most or all of the components are also missing in some fungi, most notably the model organism Saccharomyces cerevisiae. Certain ascomycetes and basidiomycetes are also missing RNA interference pathways; this observation indicates that proteins required for RNA silencing have been lost independently from many fungal lineages, possibly due to the evolution of a novel pathway with similar function, or to the lack of selective advantage in certain niches. Gene expression in prokaryotes is influenced by an RNA-based system similar in some respects to RNAi. Here, RNA-encoding genes control mRNA abundance or translation by producing a complementary RNA that binds to an mRNA by base pairing. However these regulatory RNAs are not generally considered to be analogous to miRNAs because the dicer enzyme is not involved. It has been suggested that CRISPR systems in prokaryotes are analogous to eukaryotic RNA interference systems, although none of the protein components are orthologous. siRNA, miRNA, and shRNA: in vivo applications. Pushparaj PN, Aarthi JJ, Manikandan J, Kumar SD. J Dent Res. 2008 Nov;87(11): 992-1003. RNA interference (RNAi), an accurate and potent gene-silencing method, was first experimentally documented in 1998 in Caenorhabditis elegans by Fire et al., who subsequently were awarded the 2006 Nobel Prize in Physiology/Medicine. Subsequent RNAi studies have demonstrated the clinical potential of synthetic small interfering RNAs (siRNAs) or short hairpin RNAs (shRNAs) in dental diseases, eye diseases, cancer, metabolic diseases, neurodegenerative disorders, and other illnesses. siRNAs are generally from 21 to 25 base-pairs (bp) in length and have sequence-homology-driven gene-knockdown capability. RNAi offers researchers an effortless tool for investigating biological systems by selectively silencing genes. Key technical aspects--such as optimization of selectivity, stability, in vivo delivery, efficacy, and safety--need to be investigated before RNAi can become a successful therapeutic strategy. Nevertheless, this area shows a huge potential for the pharmaceutical industry around the globe. Interestingly, recent studies have shown that the small RNA molecules, either indigenously produced as microRNAs (miRNAs) or exogenously administered synthetic dsRNAs, could effectively activate a particular gene in a sequence-specific manner instead of silencing it. This novel, but still uncharacterized, phenomenon has been termed 'RNA activation' (RNAa). In this review, we analyze these research findings and discussed the in vivo applications of siRNAs, miRNAs, and shRNAs. Nature Reviews - A high quality movie describing inhibitory RNA events and mechanisms. Lee RC, Feinbaum RL, Ambros V.
Harvard University, Department of Cellular and Developmental Biology, Cambridge, Massachusetts 02138. Lin-4 is essential for the normal temporal control of diverse postembryonic developmental events in C. elegans. lin-4 acts by negatively regulating the level of LIN-14 protein, creating a temporal decrease in LIN-14 protein starting in the first larval stage (L1). We have cloned the C. elegans lin-4 locus by chromosomal walking and transformation rescue. We used the C. elegans clone to isolate the gene from three other Caenorhabditis species; all four Caenorhabditis clones functionally rescue the lin-4 null allele of C. elegans. Comparison of the lin-4 genomic sequence from these four species and site-directed mutagenesis of potential open reading frames indicated that lin-4 does not encode a protein. Two small lin-4 transcripts of approximately 22 and 61 nt were identified in C. elegans and found to contain sequences complementary to a repeated sequence element in the 3' untranslated region (UTR) of lin-14 mRNA, suggesting that lin-4 regulates lin-14 translation via an antisense RNA-RNA interaction. Two small temporally regulated RNAs (stRNAs)* of 22 nucleotides regulate timing of gene expression during development of the nematode C. elegans. This regulation occurs at a posttranscriptional, presumably translational, level and is distinct from RNA interference (RNAi). One of the two stRNAs, let-7 , as well as its target gene, lin-41 are highly conserved even in humans, suggesting a wide employment of stRNA-mediated gene regulation. Recent reports indicate that these two stRNAs are indeed likely to represent only the tip of an iceberg with hundreds or more of additional micro-RNAs (miRNAs) existing in metazoans. miRNAs might thus be previously underestimated key participants in the field of gene regulation. RNA interference is a process of gene silencing that plays an important role in development and maintenance of the genome. The RNAi pathway is complex. It is initiated by the enyzme dicer which cleaves double stranded RNA (dsRNA) into 20-25 bp fragments. An RNA-induced silencing complex (RISC) is then formed by base pairing between complementary mRNA and 1 of the 2 strands of each new fragment. This formation of the RISC complex is followed by degradation of the complementary mRNA by the endonuclease argonaute. Argonaute is the catalytic component of the complex. The short 20-25 bp fragments are known as small interfering RNA (siRNA) when they are artificially introduced and microRNA (miRNA) when they are produced endogenously. RNA interference has become a valuable research tool since it allows the prevention of translation of specific genes by introducing siRNA complementary to the mRNA one wishes to suppress. In plants, Drosophila, and C elegans, RNA interference plays an important role in viral immunity. The plant Arabidopsis expresses several dicer homologs that react to different viruses. Some plants also express siRNA in response to invasion by bacteria. The role of RNAi in mammalian viral immunity is not as well understood. In addition to viral immunity, components of the RNAi pathway play a role in the maintenance of the genome, pretranscriptionally. RNA-induced transcriptional silencing (RITS) is a process by which argonaute and other proteins act to modify histones and induce heterochromatin formation. This serves to downregulate genes by preventing transcription. 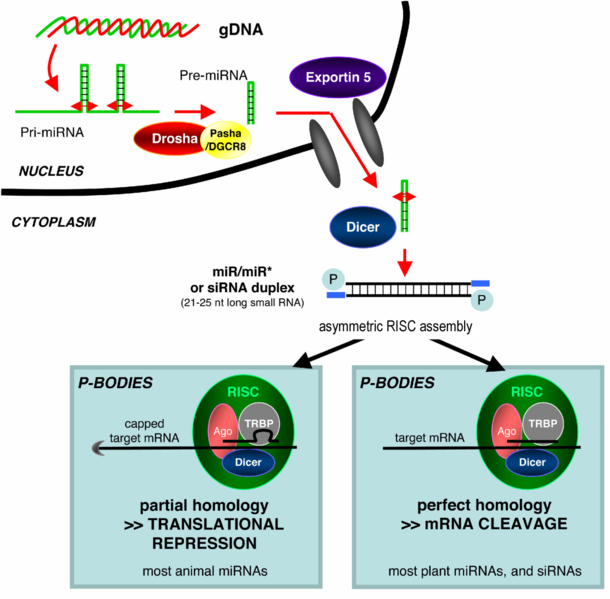 Endogenously produced miRNA regulates development by translational repression. These miRNA are especially important in the timing of morphogenesis and maintaining stem cells in an undifferentiated state. In addition to research applications, RNAi may play an important future role in medicine. It is problematic to deliver long dsRNA strands into mammals due to the interferon response. The use of siRNA mimics has met with more success. Sirna Therapeutics and Alnylam Pharmaceuticals were the first to introduce siRNA into clinical trials for the treatment of macular degeneration and respiratory syncytial virus, respectively. Other clinical applications for RNAi may include antiviral activity, treatment of cancer, and neurodegenerative diseases such as Huntington's disease. An important area of research for RNAi therapy is the effective delivery of siRNA to target cells. Spätestens seit der diesjährigen Nobelpreisvergabe ist die RNA-Interferenz (RNAi) in aller Munde. Mitte Dezember werden die US-Forscher Craig Mello und Andrew Fire den wohl renommiertesten Wissenschaftspreis in Stockholm in Empfang nehmen (vgl. S. 4). Angesichts Tausender von Publikationen seit Entdeckung der RNAi beim Fadenwurm C. elegans hatte das Nobel-Komitee es nicht leicht mit der Auswahl – trotz zahlreicher bahnbrechender Anwendungen entschieden sich die Juroren diesmal für die Erstbeschreibung des Phänomens. Diese Themenausgabe widmet sich den aktuellen Anwendungen der RNAi-Technologie, die klassische Verfahren zur Genfunktionsbestimmung ergänzt. 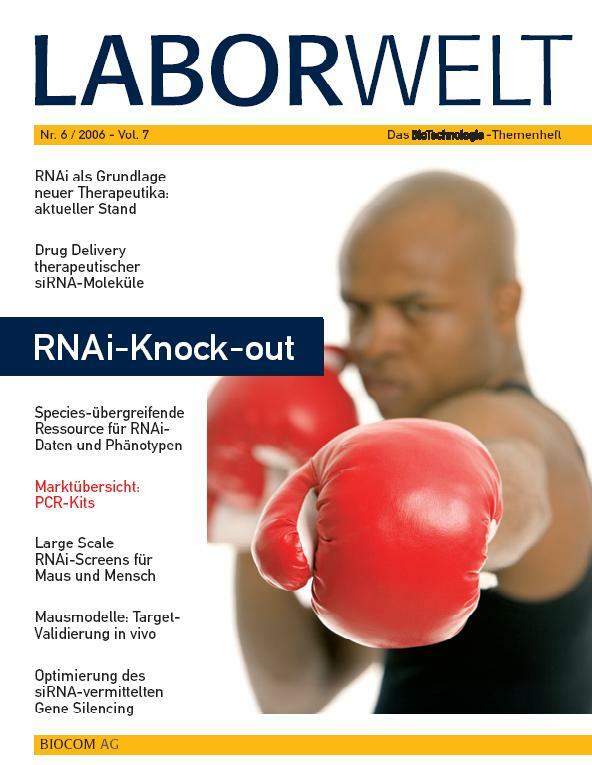 Der Focus liegt dabei auf neuen Optionen, die die RNA-Interferenz in Forschung und Klinik eröffnet – sei es in Krankheitsmodellen (vgl. S. 11), der klinischen Wirkstoffentwicklung und dem damit eng verknüpften Wirkstofftransport (vgl. S. 6), bei der Genfunktionszuordnung (vgl. S. 18-26) oder der Nutzung von Orthologie beziehungen mit Hilfe neuer Datenbank-Werkzeuge (vgl. S. 14). Auch in vivo-Nebenwirkungen und das Überlappen mit natürlichen RNA-Regulationsmechanismen werden diskutiert (vgl. S. 18, 22). GEN Technology Updates are composed of articles commissioned for publication by Genetic Engineering News and of peer-reviewed scientific papers from journals published by Mary Ann Liebert, Inc. They are intended to provide in-depth information and coverage on cutting-edge technologies and trends that are transforming drug discovery and biotech product development. Are siRNAs Specific Enough to Become Therapeutics?